Organizers teach BobcaThon participants the steps in a line dance to NSYNC. Photo by Evan Chwalek. “BobcaThon is all about love,” said 2014 OU graduate Carly Damman as she brought her speech to an end at the opening ceremony of BobcaThon, an OU campus organization that she formed. When beginning her search for a job during the winter of her senior year, Damman, then a student studying strategic communications, realized that she really just wanted to make a difference in peoples’ lives. “I really wanted a fulfilling career that I was passionate about every day,” said Damman. She reached out to non-profit organizations in the Columbus area, which led her to having a conversation with the marketing director of the Ronald McDonald House of Central Ohio. Damman landed an internship post-graduation with RMHC but wanted to do something while she was still an OU student. After the director expressed RMHC’s interest in starting a dance marathon at OU, Damman took off with the idea. 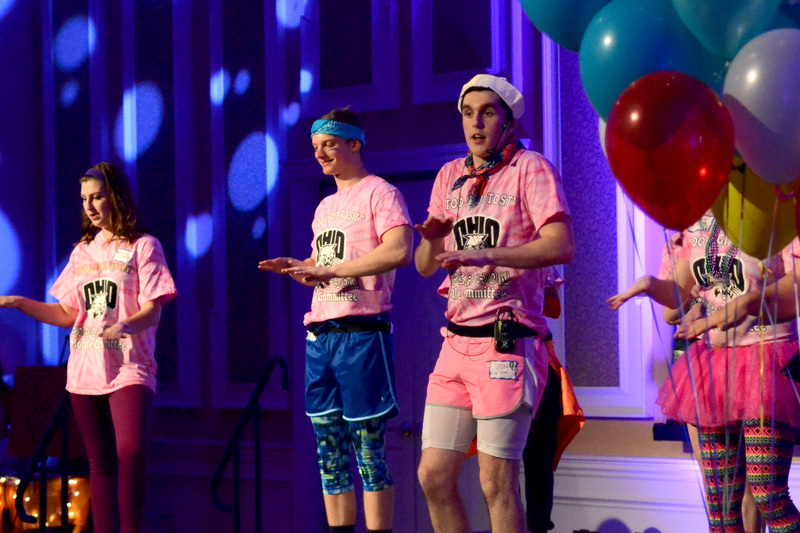 Damman’s effort to begin a dance marathon over the past year combined with a fully-staffed executive board resulted in the first ever BobcaThon dance marathon possible this past Saturday. 135 Bobcats spent their Valentine’s Day dancing for the families who benefit from the Ronald McDonald House. For three decades, Central Ohio’s RMHC has been serving families with seriously ill children by providing a home-away-from-home at the Columbus Ronald McDonald House. To dance on Saturday, participants had to raise a minimum of $100. Many, however, went above and beyond their quota. One of those students was Anna Seethaler, a sophomore studying communications. Through the use of social media and the generosity of her friends and family, Seethaler was able to raise the most money for RMHC with a grand total of $1,059. 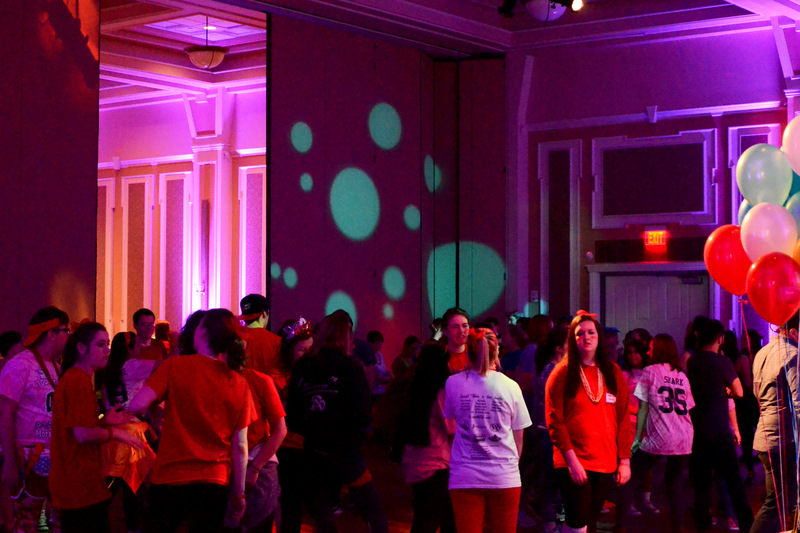 Students gather in the Baker Ballroom during the BobcaThon. Photo by Evan Chwalek. Nine families from the Ronald McDonald House made appearances throughout the dance marathon to motivate the dancers. Not only were the dancers excited to see the families for whom they were raising money, but rumors were circulating throughout the morning of that Cinderella would be making an appearance during the dance marathon to help celebrate the birthday of 2-year-old Autumn. Autumn’s family, one of the nine families who attended the BobcaThon, delivered inspirational words to the dance’s attendees. The atmosphere inside Baker University Center on Valentine’s Day morning was one of anticipation and electricity. Colorfully dressed dancers and volunteers hurried to finish last minute preparations before the 12-hour dance marathon began. “Besides a little fiasco we had with the balloons, things have gone smoothly so far,” said sophomore Kendra Lutes, the director of recruitment and campus relations for BobcaThon. Ronald McDonald himself was standing on the side of the stage, his signature fire truck red smile bigger than ever, as President of BobcaThon Mackenzie Leskovec, a senior studying child life, gave a very powerful speech to end the opening ceremony. “We dance so families can heal together,” she said with emotion. Dancers then enjoyed their last few seconds sitting before the dance marathon kicked off with, “Let’s Get It Started” by the Black Eyed Peas. The dancing had begun and wouldn’t stop until 12 a.m.